‘Über seinen eigenen Schatten springen’: German expression meaning to surpass oneself, go beyond the point one has always been in, to break the mold. ‘Über seinen eigenen Schatten springen’: is the only German I know. Useful everyday greetings and niceties haven’t taken root but this expression, learned while on residence on the North Frisian Island of Sylt, at Sylt Quelle Foundation for Artists in 2010, always returns to me. Before I get to the leap, I want to talk about taxidermy. What fascinates me about it? That at some point, someone was so much in awe of this little beast in its natural habitat that they shot it. Then, they took out every scrape of ‘real’ from its inside or else the finished product would shrivel up and wouldn’t look at all real or natural. They stuffed it. They arranged its limbs and head in pose that suggested movement. And with movement – life. (Nudge nudge to the Italian Futurists). They surrounded it with rocks, ferns, heather and gorse – all the things that belonged to his world on that fateful day when a man with a gun fell in love with what he saw and wanted to keep it forever. A taxidermy fox lived in our family. What bothered me was how he seemed to be trying hard to be alive. In its mouth, a taxidermy duck, as dead as Foxy, as old as Foxy, but stuffed and positioned to mimic ‘half-dead’, floppy and covered in blood in Foxy’s teeth. All of this, in an alter-like glass case, rimmed with mahogany. Its making was an instruction to give it devotion. The eyes were more dead than he was. In a shop called Tombées du Camion in Montmartre, you can buy both human and taxidermy glass eyes (if ever you have a need for such a thing!). It’s a shop of obsessively organized random knick-knacks. They sell eyes in bunches like flowers, and so between stuffed animal and glass eyes began my story: Foxy. Since then, the story has had a life of its own. It was at first, homeless. Then The White Review gave it shelter. I was asked to exhibit a ‘partner’ exhibition to the solo exhibition of the artist, Carwyn Evans at g39 gallery, Cardiff (contemporary art space). I am not a visual artist, but when the question came, thankfully, this didn’t seem to bother me. Carwyn and I have tried to find the right opportunity to work together for many years. 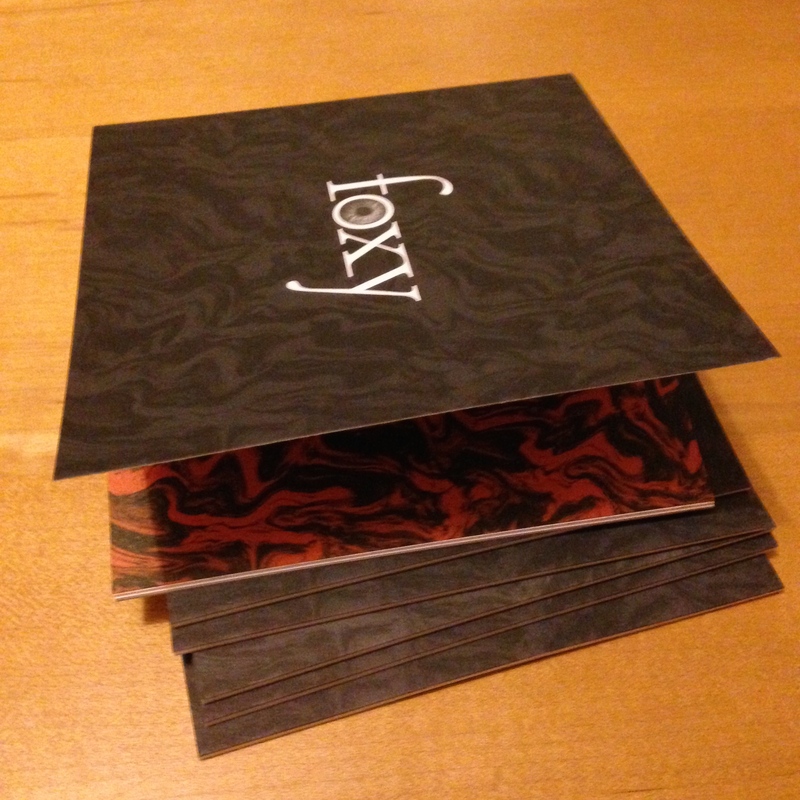 Foxy seems to be a story that insists on living, on finding new forms. – Taking photographs of glass eyes in a Montmartre street with writer, Owen Martell. 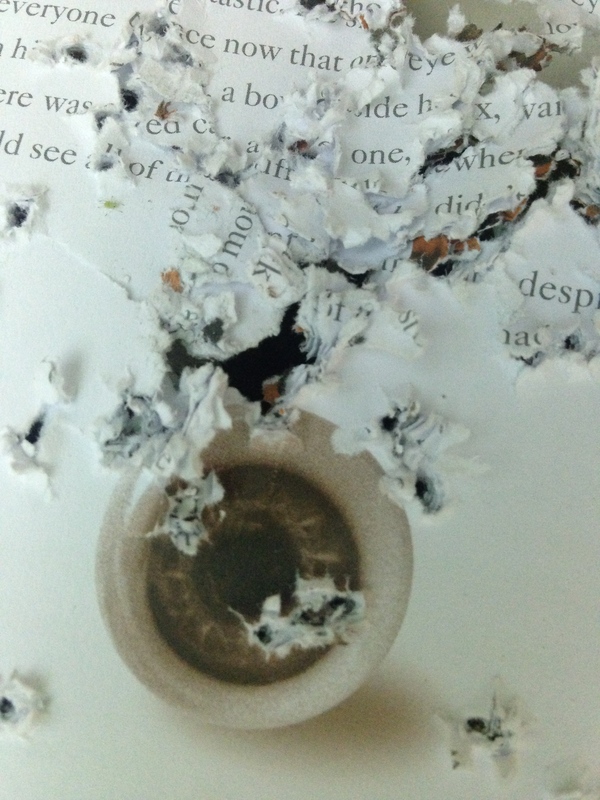 – Holding shotguns in a field somewhere in the Taff Valley as a man I’d never met before shot holes into copies of my limited edition wee book for the installation . And without really being aware of it (blessings of being too busy to really notice), Foxy has translated from taxidermy object to story to visual art and I with it have jumped over my own shadow. There: sometimes a foreign expression suits what I want to say better than my own languages. Foxy – the real fox – may one day have taken a leap of faith from the safety of heather and bilberries to be seen, to be shot. This leap is what I hope to honour.